LMAO! Exactly hence shy she'd literally blown a fuse and zapped Beeks across the control room. That's exactly what I was saying my apologies that I wasn't clear and I hadn't thought to use the Boogiem*n comparison. Though it has always been my theory that Alia's leaping is being run by Satan whether they entertain the thought or not as PQL believes God is running Sam's leaps. Zoey does make an ironic comment that they'd "clawed their way out of hell" to earn home wrecking assignments instead of murder. Why was Zoe surprised to learn about Sam? If the Evil Leaper Project was created as a reaction to PQL, then Zoe should have known Sam was there. She did seem genuinely surprised. If Alia and Sam could see each other, why couldn't they see each others' holograms. When Zoe is trying to get Alia to shoot Sam, Sam says "don't listen to her" as if he could hear Zoe. That maybe Sam and Al knew someone who they used to be friends with and bought them to work on the project. Yet some sort of conflict arose causing them to have to fire him. Interesting idea. My theory about the origins of the Evil PQL may have something to do with the extra handlink left behind in "Leap Back". 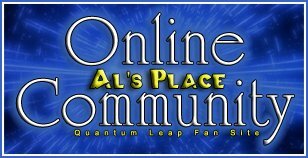 Of course if the whole idea was to counter Project Quantum Leap, why did Zoe not know about Sam before that leap? Maybe Lothos knew but kept it secret. Not necessarily true, Alia could have transitioned into the reading lessons as something new "Connie" had decided to try. Zoe may have known of Sam's theories, but that doesn't mean she would necessarily know that he was leaping around in time too. Sam and Alia touching was enough to break through the auras surrounding them so they could see each other, but each hologram is only tuned into each leaper's brainwaves. There would need to be a brainwave connection (not just breaking through an aura) to be able to see the other hologram. And before you ask, in Revenge of the Evil Leaper, Alia can see Thames because Zoe is linked to both Alia's and Thames' brainwaves. I don't understand what you mean here. Sam did leap in to directly counter Alia - if the leap "never happened" how could he have countered Alia? Again, we don't have any confirmation that Zoe was actually involved in the creation of their project, only that she ended up being the hologram (although she was originally going to be the leaper but suggested Alia as a favour). Alia actually falls for that "you kill me and you'll kill yourself" stuff? Perhaps assuming she'd been tortured before this was irrational but she still could have been under manipulation. I concur that prior to crossing paths with Sam, she'd obeyed orders with the belief that there was nothing else but that doesn't indicate that she wasn't manipulated into participating in the first place. Her obedience doesn't indicate that she was alright with it, she wouldn't have ever voiced it because she didn't believe it would accomplish anything and perhaps she'd anticipated that she could be punished for having treacherous thoughts. Recall that she'd fought for the 'privilege' of doing the lighter assignments vs. murder. "We had to claw our way out of hell to land simple assignments like homewrecking and adultery!" It can be assessed that the 'we' wasn't genuine because Zoey doesn't have any objection, ruining and flushing out lives fills her with the glee of a child on Christmas morning, hence why she was the original choice as the leaper. I concur with the theory that their project was created directly to counter Sam which Alia and even Zoey clearly didn't know, suggesting that both of them are pawns, both manipulated in some form. I'm willing to consider that perhaps Zoey actually believed what she tried to convince Alia of regarding the way out because she herself was manipulated into believing it. I still believe that inside her, Alia did feel something genuine for Sam prior to the speech. She'd regarded him with fascination when she'd asked "do you always think about the other people?" . He'd already gotten to her by the time she was given the order to kill him because her immediate response was doubt. "Why? He hasn't tried to stop us." She just needed to have a gun put in her hand to be able to acknowledge that she was stewing over him almost the entire time which supports that she'd been conceding to her role for at least for a while.